In his astonishingly short career Eddie Gorman released just three songs covering two singles before disappearing from sight and the first two sides were both hits. This is the side that wasn’t. Though in almost any endeavor a 66.3% success rate is worth admiring, that success strangely wasn’t worth much to him at the time when he didn’t even merit a third release from DeLuxe despite them having four additional songs to issue, nor did he attract any attention from other labels when he was cut loose. In the years since his name has all but been forgotten, a casualty in a generational genocide. Even his hits, because they appeared in the now defunct Cash Box regional listings rather than Billboard’s national charts, have been erased from the history books, his existence as a recording artist reduced to mere small print numbers in a record label discography. Since this is Eddie Gorman’s last appearance on these pages there’s a lot for us to wrap up, so first things first: Beef Ball Baby, despite being the only one of Gorman’s three sides not to score on a published chart, is NOT the reason for his sudden disappearance from the stage. Record labels had little expectations for B-sides to begin with and once the top side of this, Telephone Blues, became such a strong seller it’s doubtful DeLuxe Records would’ve done more than shrug their shoulders if they’d been told that every single person who spun the A-side ignored this side, or even if they lost their lunch while listening to it. So while this certainly was a huge step down from what adorned the flip side, its failure to find an audience and its failure to live up to reasonable artistic standards only means Gorman’s farewell is a rather muted one musically, not that it was responsible for his hasty exit. But since this is a review of that side let’s not beat around the bush any, Beef Ball Baby was a bad idea that was badly executed and as such it leaves a bad taste in our mouths as we leave the table at Eddie Gorman’s farewell dinner. Trying to base the appeal of a music record on comedic shtick isn’t ever going to be easy in rock’s long history in large part because you’re relying on two totally different attributes that don’t naturally fit together. A song’s primary pull comes from the musical allure of the melody, chords, arrangement, rhythm and beat. It needs to be something that not only stands up to repeated listening but becomes so addicting you want to hear it again and again. Comedy on the other hand thrives on the unexpected, a punch line to a joke, a funny twist to a story, a clever turn of phrase that catches you off guard. But once you remove the surprise from the equation the laughs tend to progressively diminish each time you hear it. That’s why the songs which do incorporate humor with success tend to fall into one of two categories. The first of which are songs that don’t rely on those sudden unexpected laughs from hearing them for the first time, but instead are tight stories where the entire premise is a humorous situation housed within a solid musical structure that can stand on its own whether you understood the lyrics or not. The Coasters excelled at this in the late 1950’s, as their best work rarely contained any one-off jokes in them. Instead the plots would present well-drawn characters usually dealing with social frustrations relatable to their audience which were then used to comment on the absurdity of those situations. But the other avenue for comedic hits in the music biz are the realm of novelty records, something which can indeed meet with big sales but more often than not they have short shelf lives, as the gimmick used to connect with audiences quickly becomes tiresome, aggravating and eventually homicide inducing if heard too much. Beef Ball Baby doesn’t quite rise to that level of annoyance but it’s pretty evident that they were aiming more for a novelty record with this and they fall well short in their attempt for one simple reason. Insult humor will never really go away. People will always look to make fun of somebody else’s imperfections in order to mask their own insecurities. In fact many studies show that comedy itself is a coping mechanism for that very thing, so it should hardly come as a surprise that a lot of jokes in life come at somebody else’s expense. Eddie Gorman however would probably insist he’s not making fun OF his girlfriend – the titular Beef Ball Baby – but rather is defending her in the face of others who are using the girl’s weight as a source of derision. While it’s true that on the surface Eddie seems perfectly happy with this girl, his voice sounding eagerly bouncy throughout, he’s merely compensating for the insults he obviously has been getting from his friends ever since they hooked up. Though it would seem laughable to suggest that first year psychology students could throw away their textbooks and simply listen to a stupid record to grasp this serious topic, the fact remains that the whole song is a textbook example of a defense mechanism to turn the attention away from you to the one you’re with. So in many ways it’s true to life as can be. An unpleasant side of life for sure, but one that surely exists and gets played out all around the world every single day in relationships. Of course I highly doubt that Henry Glover and Sam Theard who wrote this were thinking about shining a light on men’s underlying insecurity when it came to relationships, they were just thinking of trying to mine that broader topic for humor and possibly get a hit. But to do that it’d have to actually make you laugh and this doesn’t come close. Now the interesting thing is that Theard was a well-known comedian, a regular at the Apollo Theater for decades, so you’d think he’d have a better grasp on humor than this shows. You’d ALSO think he’d have a better grasp on the musical side of the equation because he was a prolific and successful songwriter who’d penned such immortal tunes as (I’ll Be Glad When You’re Dead) You Rascal You which became a Louis Armstrong standard, and Louis Jordan’s bluesiest hit, the oft-covered Let The Good Times Roll. He was also no stranger to rockin’ sides either having penned Hard Ridin’ Mama which both Wynonie Harris and Paul Bascomb, under the name Manhattan Paul, cut over the past year and a half. It’s hard to believe that someone whose compositions were recorded by such luminaries as Count Basie and Eddie “Cleanhead” Vinson would come up with something as pitiful as this, especially with Henry Glover, trumpeter, arranger and producer of great renown, lending a hand. But pitiful it is as they essentially just have Gorman rattle off a succession of insults to his obese girlfriend about how many wrinkles she has in her face and how lumpy her body is, but then excuse his obnoxious behavior by claiming no one else wants her but him, therefore apparently that makes it okay to mercilessly taunt her every chance he gets. If any of it drew even the slightest involuntary smile while listening, as inexcusable as that reaction would be, you might be inclined to go a bit easier on them all, but there’s not a single line here that comes close to breaking the stone faced response it elicits. Over the course of his previous two songs Gorman has shown he’s capable of portraying a character who can keep things lighthearted. He was at his best when he was essentially making fun of himself as his relationship crumbled on Telephone Blues but was considerably less successful at it – though certainly tolerable – when trying to embody the desperate blowhard seeking a date on the earlier Don’t Worry ‘Bout Nothin’. On both of those performances however he utilized a much better vocal approach when singing than he does on Beef Ball Baby where he attempts to sell the so-called jokes by adopting a more blatantly exaggerated tone. Gone is his masterful Jimmy Ricks impersonation and in its place is someone making a half-hearted attempt at singing, almost as if he isn’t sure he can stay in tune when doing karaoke and so he attempts to deflect criticism by intentionally not taking it seriously. Making it even worse is his awkward over-emphasis on the title line, spitting out the word “beef” as if the sheer sound of it would make you crack up. Not that he could’ve possibly done anything with it to salvage any of this but by drawing more attention to that supposed punch line by his choice of delivery he only makes this fall even flatter than it would’ve had he simply kept that particularly offensive aspect more concealed. About the only thing that redeems this record even slightly is Paul Gayten who contributes a pretty decent arrangement that kicks off with a nice three-way back and forth intro between him on piano, guitarist Jack Scott and especially stand-up bassist George Pryor. It’s distinctive and unique and further shows that Gayten was never content to just mail it in, even on something as unpromising as this mess. To that end he chimes in with a good piano solo later on in the break, not all that adventurous maybe but since it keeps Gorman from reciting these putrid lyrics for twenty-five seconds it stands out as a high point on the record. In spite of the ill-conceived song, the unfunny lyrics and the generally poor delivery we can still mostly excuse the participants, from Glover and Theard, who had far too much quality work over the years to let this taint their legacies, to Gayten and the band, about the only ones who manage to come out relatively unscathed in all of this, and even Gorman himself, who was presented with a subpar song and did what he could with it. If anyone should be faulted for this monstrosity it’d be DeLuxe Records for putting out Beef Ball Baby in the first place. But even there we have to pull back just a little because we’re not quite certain of where to place the blame. 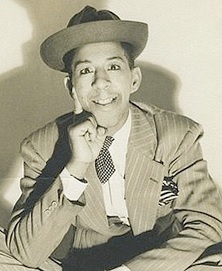 The record label was in the process of being absorbed into the King Records stable, which is why Glover, who was King’s best producer, was involved. The founders of DeLuxe, Jules and David Braun, were being forcibly pushed out and would soon form Regal Records, taking Gayten, one of their original and most successful sigings with DeLuxe, with them. Which brings us back to the fate of Gorman whose career ends here after two regional hits including the top side of this which is as good a record as any in the winter of 1949. Though the specific reasons for his sudden termination are mostly speculative, ranging from the idea that once his marriage to female star Chubby Newsom ended there was no longer a reason to record her less skilled ex-husband, to the possibility that an ensuing brief jail term for forging checks made him too big of a risk, those reasons don’t quite hold up to scrutiny. Though this is based on simple deduction and a good deal of verified, if circumstantial, evidence, the likeliest reason has to do with King’s formal takeover of DeLuxe. Syd Nathan had originally bought a majority stake in that label to help alleviate the Brauns cash flow problems, but the real reason was to get his hooks into the biggest star on DeLuxe, the founder of rock ‘n’ roll itself, Roy Brown. Once he had Brown he had no need for the rest of that label’s roster. He did (wisely) hang on to Dave Bartholomew, but he didn’t even keep Gayten and Annie Laurie, both of whom were established stars, nor did he retain Newsom who was riding a big hit of her own and if nothing else was an attention getter with her sultry looks and records filled with sexual innuendo. Now it could be that their contracts were nearing an end. Usually smaller independent labels at the time were signing artists for shorter length deals until they’d proven their worth and so it’s entirely possible that their deals were about to come up and the Brauns convinced those artists to agree to leave DeLuxe when they ended and go with them to Regal, as all three of those artists wound up doing, thereby thwarting Nathan to some degree in his underhanded power play. As for Gorman though the break up with Newsom might very well factor in now, as the Brauns would seek to keep Chubby happy as she was a much bigger star with far greater potential and thus Gorman, through no real fault of his own, wasn’t taken in along with the others. If his aforementioned legal troubles followed soon after then it stands to reason that he’d be somewhat forgotten while he was in the pokey as the music scene kept rapidly evolving with new acts appearing all the time. Speculative, I know, but very feasible if you just connect the dots. The sad part of this is that Gorman deserved far better. It wasn’t until 2015 when the wonderful CD collection which took its name from this song and covered this period in DeLuxe’s New Orleans history revealed that they had four more sides in the can on Gorman available for release, all of which are interesting, some pretty good and one of which, Hey Now, is well above average. Considering that Eddie Gorman had only two releases and both were hits it’s hard to imagine how that song wouldn’t have extended his hot streak and been a hit as well. Instead his story ends here, on a non-hit B-side with the cruelly ironic twist that of everything he did during that brief time Beef Ball Baby was by far the weakest thing he ever cut and yet that is what would wind up being his career epitaph. 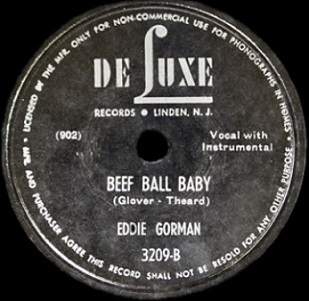 Leave a reply on "Eddie Gorman: “Beef Ball Baby”"